These shower chairs offer stability, comfort, and tool-less assembly in seconds. The all-composite legs have precise twist height adjustments from 15-21". Deep contoured seats provide maximum showering comfort. 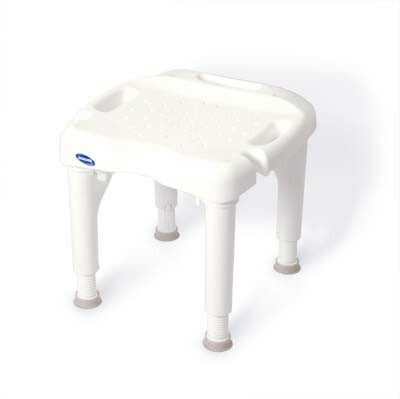 Fit into most standard tubs, while offering large rubber tips on the legs for additional stability. Weight capacity: 400lbs. Limited lifetime warranty. Uses Microban technology. Seat Dimensions: 18" x 20" • Seat Height: 15" - 21" • Base Depth: 17 1/4" • Base Width: 16 1/4" • Product Weight: 8.25lbs without back. how does it fit together and break apart. please demo how it assembles and and disassembles? Does it have a carrying bag ? Instructions have been included for convenience. willl this fit into a small mobile home bathtub about 16 inches wide on bottom ? This item will not fit in a bathtub of that size due to the width measurement of 20 inches. Does it have a back? This particular model does not come with a back. is it height adjustable ? The seat is adjustable between 15 and 21 inches. Excellent product. Works well. Nice compact design. My father is 400lbs and it holds him with no problems. I really like this chair, cause we travel and it is easy to take apart and take with you. I don't know what you want in this box. This chair is much more solid than the one that we had previously, and works very well in our shower. prior to this chair we had one from you with aluminum legs. It did not hold up well. Like this chair very much. As I get old, it's getting harder and harder to stand still during shower. So I got it to take a shower more comfortably and it's giving me a great help. Whenever I get soggy I can just sit on this chair. It's greater than you might imagine! I would recommend this product. I am very happy with the purchase.